The Stanford-Binet intelligence scale is a standardized test that assesses intelligence and cognitive abilities in children, beginning at age two, and in adults. The Stanford-Binet intelligence scale is used as a tool in school placement, in determining the presence of a learning disability or a developmental delay , and in tracking intellectual development. In addition, it is sometimes included in neuropsychological testing to assess the brain function of individuals with neurological impairments. The Stanford-Binet intelligence scale is a direct descendent of the Binet-Simon scale, the first intelligence scale created in 1905 by psychologist Alfred Binet (1857–1911) and Theophilus Simon. Lewis Terman (1877–1956) published the Stanford-Binet scale initially in 1916. As of 2004, the scale had been revised five times—in 1937, 1960 (with a scoring change of this version in 1973), 1986, and 2003. Beginning with the fourth revision (1986), the test underwent design changes to include a larger, more diverse, representative sample in order to minimize the gender and racial inequities that had been criticized in earlier versions of the test. Originally designed for children only, with the fifth edition (2003) the Stanford-Binet can be used on anyone older than two years of age. The Stanford-Binet scale tests intelligence across six areas: general intelligence, knowledge, fluid reasoning, quantitative reasoning, visual-spatial processing, and working memory. These areas are covered by ten subtests that include activities measuring both verbal and non-verbal intelligence. Activities include verbal absurdities, picture absurdities, verbal analogies, form patterns, procedural knowledge, sentence and word memory, position and direction, early reasoning, and quantitative reasoning. All test subjects take two initial routing tests: a vocabulary test and a matrices test (which assesses non-verbal reasoning). The results of these tests, along with the subject's age, determines the number and level of subtests to be administered. Total testing time is around 45 to 60 minutes, depending on the child's age and the number of subtests given. Raw scores are based on the number of items answered and are converted into a standard age score corresponding to age group, similar to an IQ measure. Teenage girl taking an intelligence test. be administered, scored, and interpreted by a trained professional, preferably a psychologist. 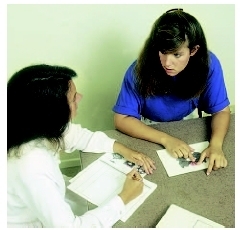 Children with physical disabilities may require certain accommodations when taking the test, such as extra time for tasks, rest breaks, or instructions received in an alternate format (e.g., signing for a deaf child). The examiner should be made aware of a child's potential limitations before the day of the test so that appropriate accommodations are available. Scoring for the Stanford-Binet generates a verbal IQ score (VIQ), a non-verbal IQ score (NIQ), and a full-scale IQ (FSIQ). It is a standardized test, meaning that norms are established during the design phase of the test by administering the test to a large, representative sample of the test population (in the case of the fifth edition, data from the 2000 U.S. census were used). The test has a mean, or average, standard score of 100 and a standard deviation of 15 for composite scores (subtests have a mean of 10 and a standard deviation of 3). The standard deviation indicates how far above or below the norm the subject's score is. For example, an eight-year-old is assessed with the Stanford-Binet scale and achieves a standard age score of 115. The mean score of 100 is the average level at which all eight-year-olds in the representative sample performed. This child's score would be one standard deviation above that norm. While standard age scores provide a reference point for evaluation, they represent an average of a variety of skill areas. A trained psychologist evaluates and interprets an individual's performance on the scale's subtests to discover strengths and weaknesses and offer recommendations based upon these findings. Test anxiety can have a negative impact on a child's performance, so parents should attempt to take the stress off their child by making sure they understand that it is the effort and attention they give the test, not the final score, that matters. Parents can also ensure that their children are well-rested on the testing day and have a nutritious meal beforehand. Maddox, Taddy. Tests: A Comprehensive Reference for Assessments in Psychology, Education, and Business ,5th ed. Austin, TX: Pro-ed, 2003. Wortham, Sue. Assessment in Early Childhood Education ,4th ed. Upper Saddle River, NJ: Prentice-Hall, 2004. Becker, K. A. "History of the Stanford-Binet Intelligence Scales: Content and Psychometrics." Stanford-Binet Intelligence Scales, Fifth Edition Assessment Service Bulletin , no. 1. Itasca, IL: Riverside Publishing, 2003. Braden, Jeffery P., and Stephen N. Elliott. "Accommodations on the Stanford-Binet Intelligence Scales , 5th edition." In Stanford-Binet Intelligence Scales, Fifth Edition Assessment Service Bulletin , no. 2. Itasca, IL: Riverside Publishing, 2003. Riverside Publishing. Stanford-Binet Intelligence Scales, 5th ed. Available online at http://www.riverpub.com/products/clinical/sbis5/home.html (accessed October 30, 2004).